The packing is done, the race course is loaded into my GPS and the car is packed. In a couple of hours, Juliette and I will be off to race the Crank the Shield, a 3 day, 250km mountain bike race from Gravenhurst to Haliburton Forest. Juliette and I are racing together as a team, working and riding together for the entire race. We work best as a team, encouraging each other and pushing each other. We havenâ€™t trained very much since the 24 hour solo a few months ago, but we are still feeling strong and are looking forward to the race. For once, the weather looks good, sunny and cool all weekend. 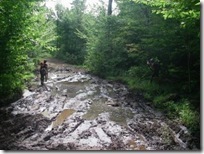 There has been a lot of rain this summer and parts of the course are still muddy as you can see from the picture taken by race organizers a couple of weeks ago. Itâ€™s going to be tough, but one that we will remember.